Kissavos is full of forestal paths that cross landscapes of incredible beauty. The map impresses with precision and plenitude the road network of the mountain, the main paths (in collaboration with Trekking Hellas), toponymy, all the villages and the settlements, and a lot of other geographic information in order to you enjoy magic excursions with the biggest comfort and safety. 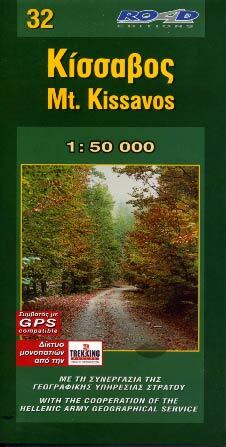 The map is accompanied by 32 pages coloured inset, in Greek and English, with alphabetical index of villages, all hotels, table with useful telephones, a chapter with general information on the mountain, and a extensive extract by the guide "Inexplored Thessaly" with presentation of the best excursions.